On the blog in 2014 we’ll be writing about the topics we’re studying, providing some constructive comments on the posts of our peers, and visiting some other class blogs from around the world to learn a bit about what goes on outside Bossley Park. First task – respond to a print ad. Students were set the task of writing a personal response to an advertisement – deconstructing how it’s put together, and how it persuades, and whether they’d be influenced to purchase the product or service. Here’s mine, as an example, but most importantly, read some of the posts below, and check out the excellent work of Year 8. The Commonwealth Bank print advertisement targets a young adult or youth market, and is advertising a competition on the bank’s website. The print ad may have been published in a magazine, as a poster, or printed as a flyer. The advertisement uses key elements of colour, branding, graphics and persuasive language, to persuade its target audience. The colour scheme of yellow and black uses the Commonwealth Bank colours, and is consistent with the bank’s branding. The large yellow text stands out against the black and white photograph in the background, and is the salient feature when viewing the ad. It draws our attention to the ad, and reinforces the brand to the audience. The text in the advertisement uses language to appeal to a youth audience. Positive colloquial terms such as “cool” and “stuff” and “check it out” are intended to appeal to the youth market, and engage them with the product. The imperative verb “check” tells the responder to do something – that is to view the website for the competition – hooking us into the product. The grungy street font is designed to appeal further to a young audience, and the use of capitals emphasises the dialogue between the two women. The central graphic of the advertisement is of two young women, further appealing to the target audience. The women’s facial expressions are laughing and happy, with wide smiles, which links happiness to the product, as they discuss the bank. The urban location and their contemporary clothing further emphasise the “coolness” of the product for the target audience. Symbolism and use of logos is also important to promote the product to its target audience. The yellow pi sign in the top right hand corner creates intrigue, and links to the web address at the bottom of the ad. The responder is interested to know more about the significance of the pi symbol, and thus will be more likely to be persuaded to go to the website. The Commonwealth Bank logo gives credibility to the advertisement, and links it to a tried and tested brand. 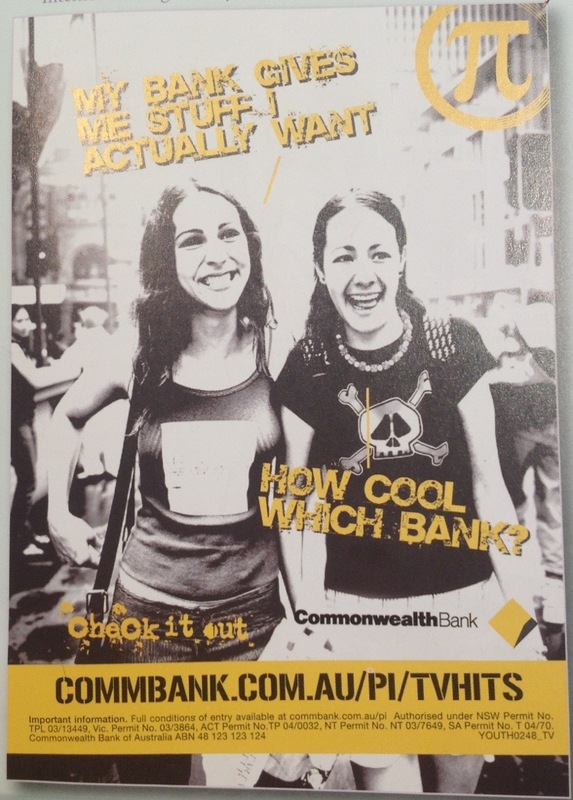 The Commonwealth Bank print advertisement is effective in appealing to a young adult target audience, particularly a young female audience. The effective use of bright yellow colour not only draws our attention, but promotes the brand of the bank. The female figures are important to the product, as they epitomise the target market, and the youthful colloquial language speaks to the audience in a language that they understand. Overall, this is a successful advertisement. If I were younger, I might be inclined to check it out. This is a good ad. i saw it and my eyes appealed to it just as you had said. It was a great choice of contrasrting color and font.